This article barely touches on a very important issue in the history and transmission of ideas, and in particular to those that are related to the celestial arts and related cosmologies. This should be read as one might read the newly exposed contents of a roll-top desk. The topic is potentially so extensive, that a small library would be required to cover even the main points. It should, however, serve as a decent introduction and I have referenced some particularly useful sources for those who wish to delve further. My hope is that this and the articles which follow will ignite further interest in this topic by cultivating informed reflection and discussion. 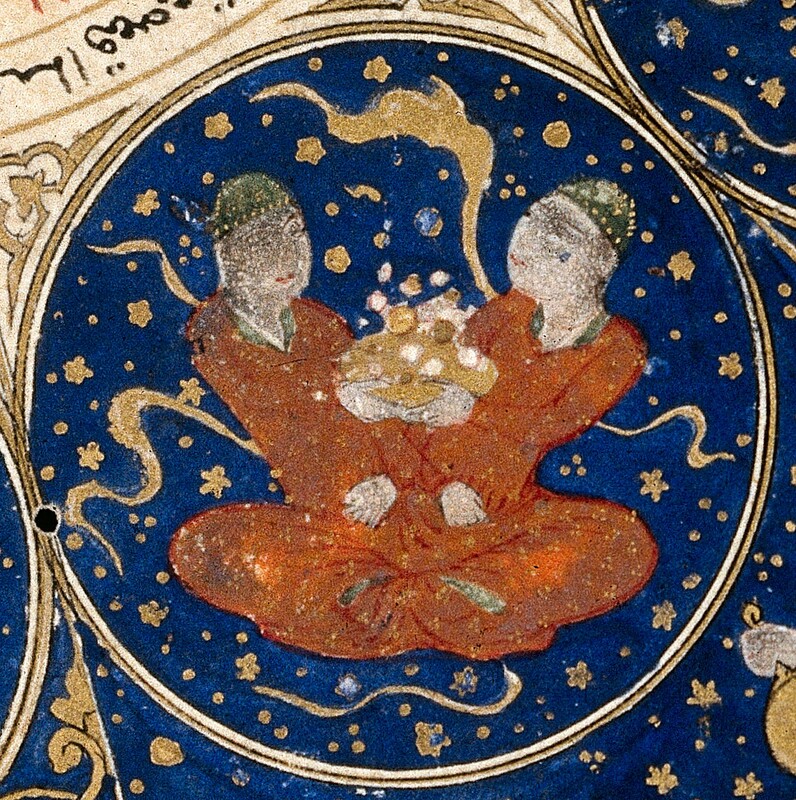 By way of extending this discussion, I’ve decided that it will best be done by a reasonably detailed account of the part played by three Persian astrologers and polymaths: Māšāʾallāh b. Aṯarī, a Persian Jew from Baṣra, was one of the leading astrologers in the ʿAbbasid caliphate from the founding of Baghdad in 145/762, Biruni, Abu Rayhan (362/973- after 442/1050), scholar and polymath of the period of the late Samanids and early Ghaznavids and one of the two greatest intellectual figures of his time in the eastern lands of the Muslim world, the other being Ebn Sīnā (Avicenna) and Abū Ḥafṣ ʿOmar b. Farroḵān Ṭabarī was an astrologer from Ṭabarestān who translated Pahlavi works into Arabic (for example, the five books on astrology by Dorotheus of Sidon) and paraphrased Ptolemy’s Apotelesmatica Tetrabiblos in 812. 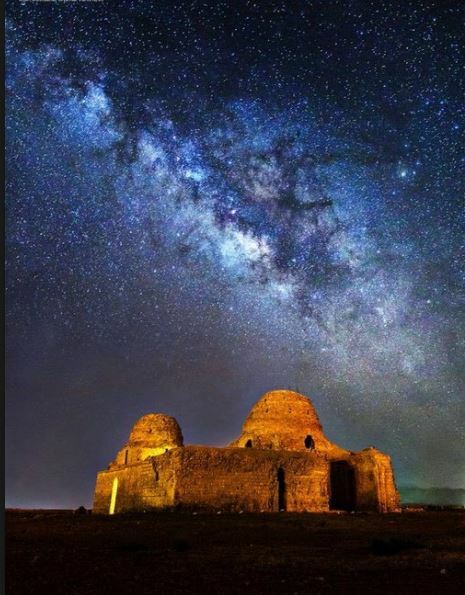 The few astronomical theories with which his name is associated are Indian; he presumably derived them from Pahlavi books. Biographical details courtesy of Encyclopedia Iranica. 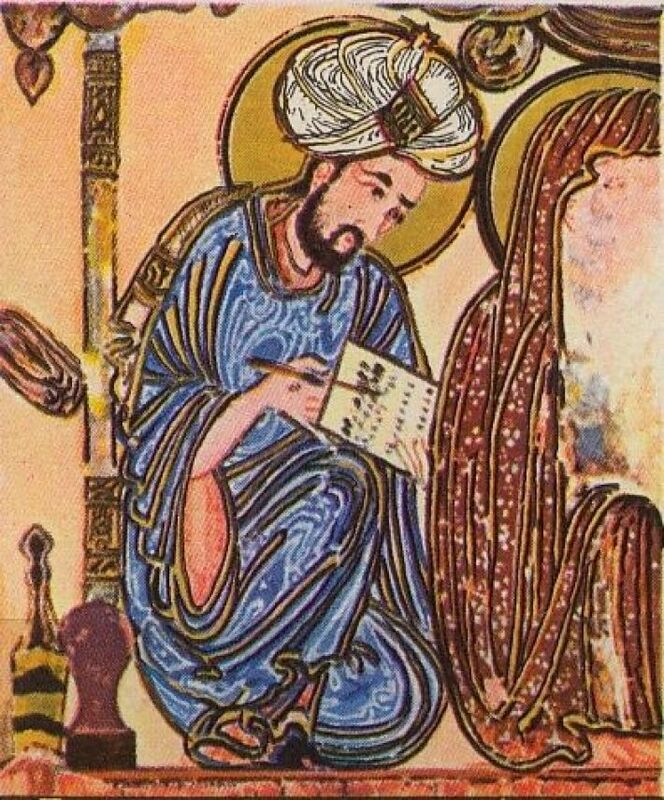 “Kevin van Bladel has produced an admirable study of the Arabic Hermetic tradition, fleshing out in considerable detail the evolution of Hermes’ image, his identification with Qur’anic prophet Idris as well as the forces driving this transformation, and his connections, real, imagined, and still controversial, with the Harranians, the last organized group of astrolators to continue functioning within Islamic civilization.” . 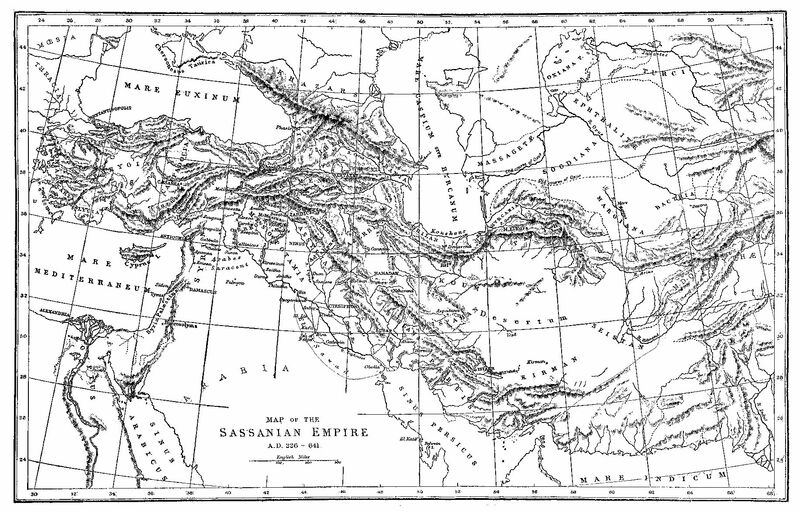 The most direct source of the reception of Hermetic knowledge in the oriental tradition was Sassanian Persia, the last period of the Persian Empire before the Islamic invasion. The empire took its name from the House of Sasan who governed from 224 to 651 AD. The Sassanians succeeded the Parthian Empire and was a leading regional and ‘world’ power, alongside the Roman-Byzantine Empire. Iy held this position for four centuries. This empire was perfectly situated to be a cultural conduit between India, Greece, Rome and the Middle East and this had been the case for a very long time. 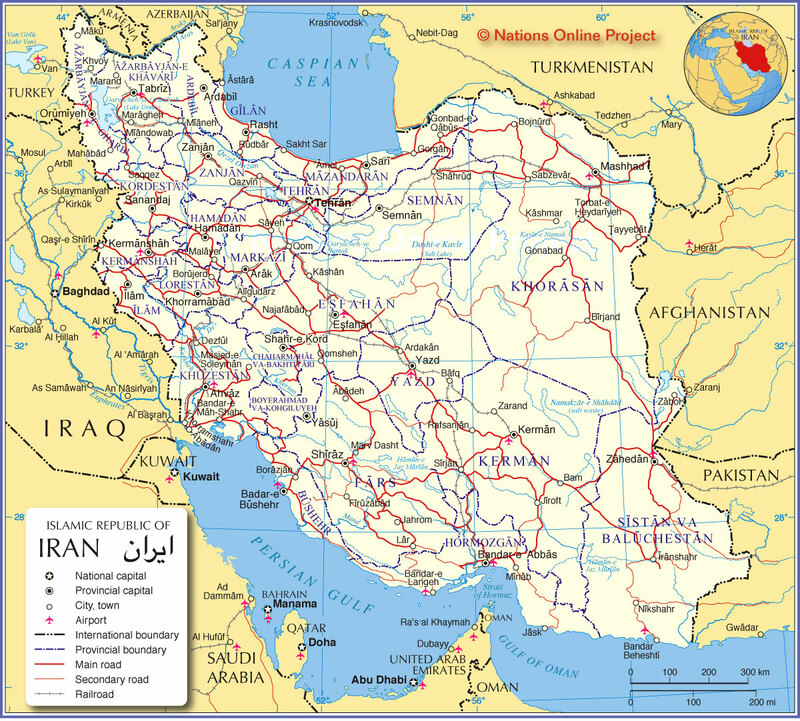 Even to this day, the strategic geography of Iran is extraordinary, sharing borders with Turkey, Iraq, Pakistan,, Afghanistan, Armenia, Azerbaijan, Russia and beyond. The US military currently has Iran surrounded in ten countries to make sure she is contained. 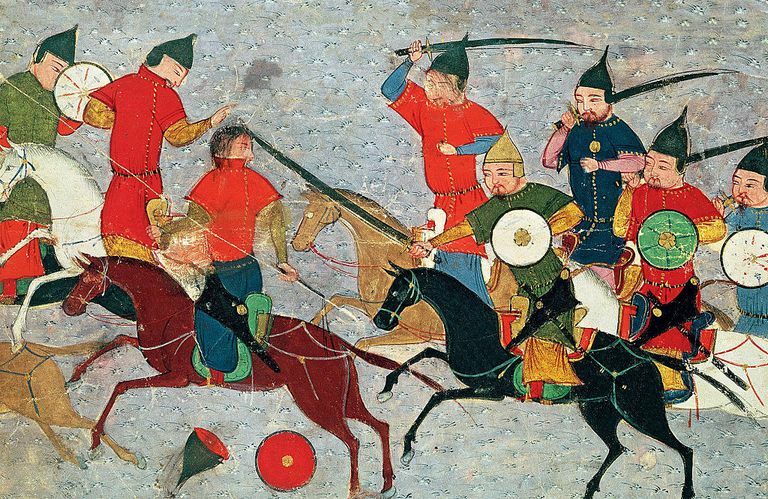 Persia had long had relations with Asia, including China long before the onslaught of Alexander the Great and the subsequent Hellenizing of much of the known world. In Alexandria, Priests of Isis mixed with Hindus and Buddhists as well as Jews, Christians and a wide array of Greek philosophers, Gnostics, and Pythagoreans. Ideas, traditions, and wisdom were not merely shared but in many cases, syncretized. It has been said of the Parsis in India that they are like sugar in milk. This is true of many traditions. It is difficult, for example, to read Plotinus without being reminded of Hindu metaphysics or to read St, John’s Gospel without being reminded of Philo, a brilliant Hellenized Jew. It is not always an easy task to see where one tradition ends and another begins. Until the Islamic conquests, which began in the lifetime of Muhammad and spread from Spain to India within 60 yrs of his death, the desert-dwelling Arabs had a primitive, but fascinating desert culture. It mostly consisted of an oral tradition and the level of literacy was not high. Written language had no great utility beyond that used in trade. Indeed the Prophet himself was known to be illiterate. The Arab tribes were frequently at war with each other, which further impeded a scholarly tradition, As a trading people, they did, of course, come into contact with other cultures. However, there were no centers of learning and those who were identified as learned were most often the Christians, Jews and to some extent the Chaldeans. The work of transposing the spoken word of the Prophet into the written Quran would have mostly fallen to Jewish scribes. Massive invasions are usually violent and demonstrate little or no interest in the culture being conquered unless it can be readily turned into profit, either of monetary or propagandistic. The second form takes places when places of indigenous worship are destroyed and replaced with the religious symbols of the invading force. This has been the key to the creation of hegemony since earliest times. Typically, indigenous languages are also replaced by the language of the conqueror. This was certainly the case with Arabic. The Persians had not taken the threat of an Arab invasion seriously. That was a fatal mistake and one that proved that a sufficiently riled up group of illiterate desert dwellers could do hitherto unimaginable damage to a greatly advanced society. The Armies of Islam would prove the same point, time and time again. Temples were razed. Religions outlawed and Mosques built where previously sacred places were celebrated by the vanquished indigenous culture. Conversely, invading forces are exposed to cultural ideas, including ones seen as scientific, that serve to edify the culture of the invader. 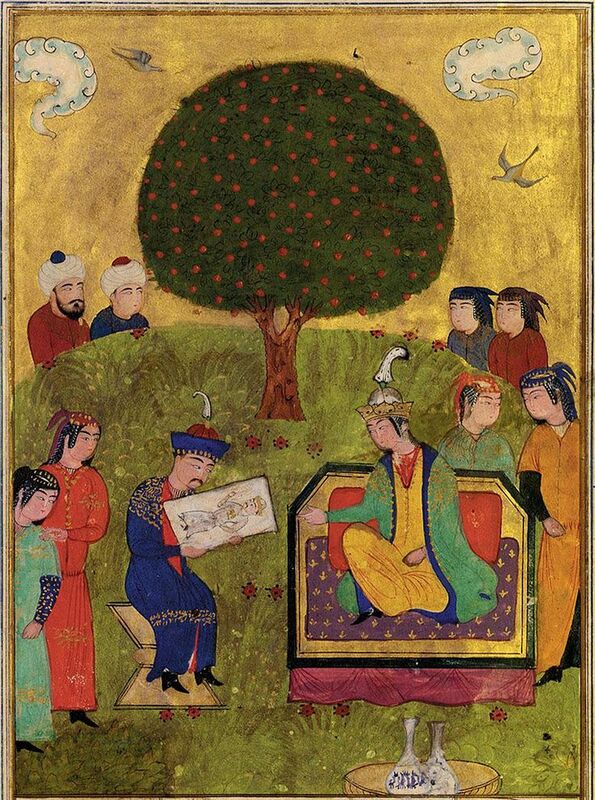 An illustrated leaf from the Sharafnama of the Khamsa of Nizami: Queen Nushaba recognizes Iskandar [Alexander the Great] by his portrait, Persia, circa 1490-1500 miniature 15.5 by 11.2cm. 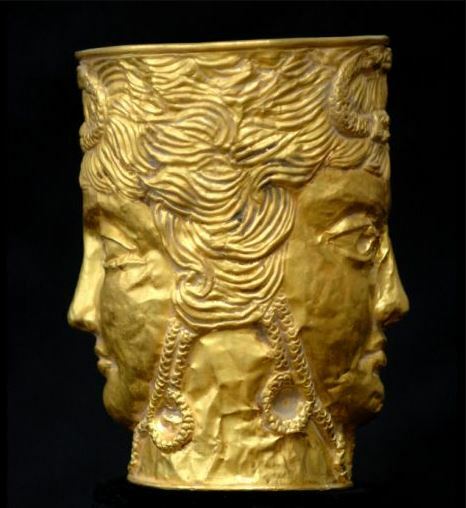 However, Persia had already suffered a much earlier blow at the hands of Alexander and beyond the savagery and brutal destruction, Persian culture was to attain the advantage of being part of the Hellenized world which, ironically perhaps, helped preserve core texts, even if many were lost forever. Alexander must have seemed a complete monster to the Persian and to this day he is known in Iran as “the horned one.” It is an irony that beggars belief that Alexander would be included in the line of the Prophets of Islam. In light of the many considerations, it may very well have happened that the ‘un Islamic’ Persian Hermetica would have been lost to history. As it happens, much of it not only survived but made its way into the Islamic world and the Arabic language. Van Bladel tells us: “The name Hermes was invoked in Sassanian Mesopotamia as a source of occult power. A few surviving texts of Syro-Mesopotamian origin provide the attestations: two Babylonian Aramaic incantation bowls containing the same formula, found at Nippur (modern Niffar) in Iraq, once part of the Sasanian Empire, and a magical amulet written in Syriac on parchment dating to Sasanian times.11 Incantation bowls are a type of popular magical apparatus inscribed with texts in different Eastern varieties of Aramaic made from about the fourth to the seventh century, that is, under the Persian Sasanid dynasty, in Mesopotamia. Unfortunately little is known about exactly how they were used.12 The two bowls mentioning Hermes invoke him as a magical power, so that the protective operation is performed not only in the name of four angels but also in the name of “Hermes the Great Lord.” One of these bowls was made for the benefit of “Yazīdād, son of Yazdāndukh(t),” both Middle Persian names indicating a Persian, perhaps aristocratic, recipient. 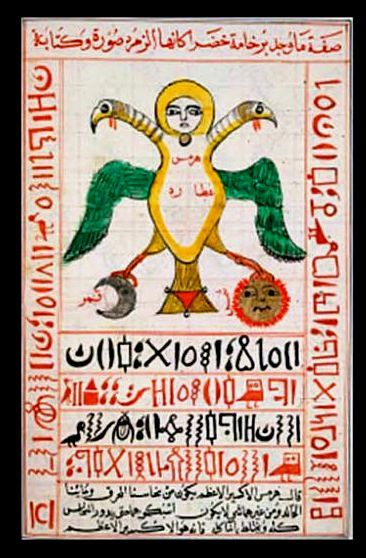 As for the parchment amulet, although it was written in Syriac, it was made for the protection of a certain ¢warrawehzād, called Yazdānzādag, daughter of De¯nag, whose name is also clearly Middle Persian” pp.25-6). These types of bowls were not uncommon: “Across the ancient world, demons and other forces of evil were treated as genuine threats to reckon with. 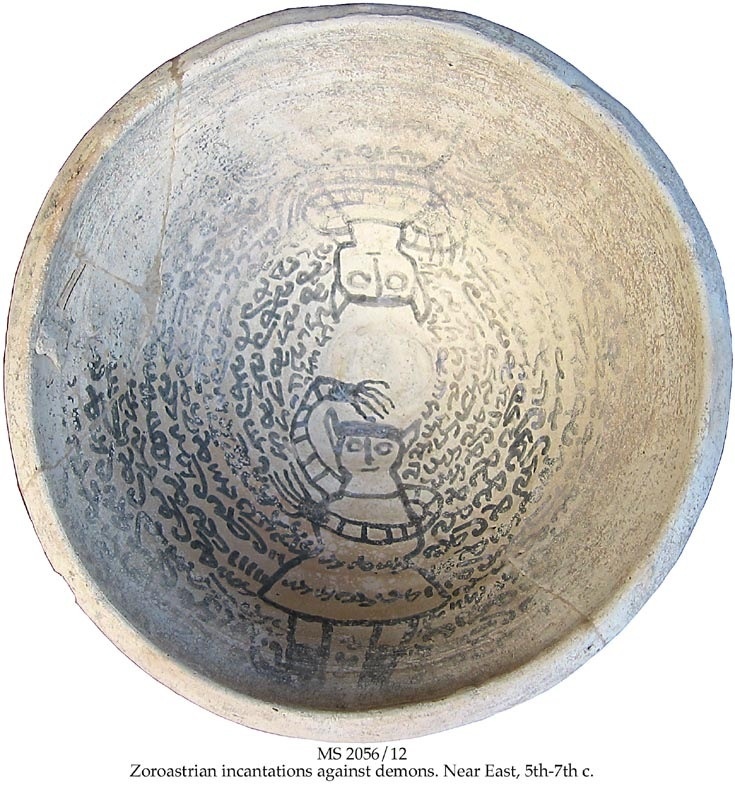 In Sasanian Mesopotamia from the fifth to the seventh centuries CE, clay Aramaic incantation bowls, commonly known as magic bowls were widely used to expel demons and protect houses.” See the work of Avigail Manekin Bamberger, a doctoral candidate in the department of Hebrew Culture Studies at Tel Aviv University. It needs to be said that these bowls were used for the same purposes by Jews and Christians. “as a prophet teaching pious commandments in the form of maxims, as well as an outline of rules for Hermes’ religion and his wise advice. Although al-Mubaššir’s treatment of Hermes and his instructions include no direct references to Ḥarrānians or to Ṣābians in general, the religion taught by Hermes in this account is similar to as-Saraxsı’s description of the Ḥarrānian Ṣābian religion: it included feasts at astrological conjunctions and at the sun’s entry into a new zodiacal sign, as well as sacrificial offerings to the planets at the appropriate times. Hermes is also said to have commanded them “to perform prayers that he stated for them in ways that he described.” On the other hand, the religious laws of Hermes given here bear close resemblance to Islamic law: they require ritual purity, abstinence from intoxication, gˇihād against the enemies of the religion, alms (az-zakāt), and prescribe most of the punishments called ḥadd punishments in Islamic law. All this leads me to conclude that the “religion of Hermes” described here was developed and described well after the establishment of Islam and Islamic law.” (pp 94-5). This was a clever maneuver but certainly not unprecedented. Most importantly, it ensured that something of the indigenous religion of Iran would prevail and with this many other elements entered the Islamic world. This was also the case with the Angelology of Zoroastrianism. 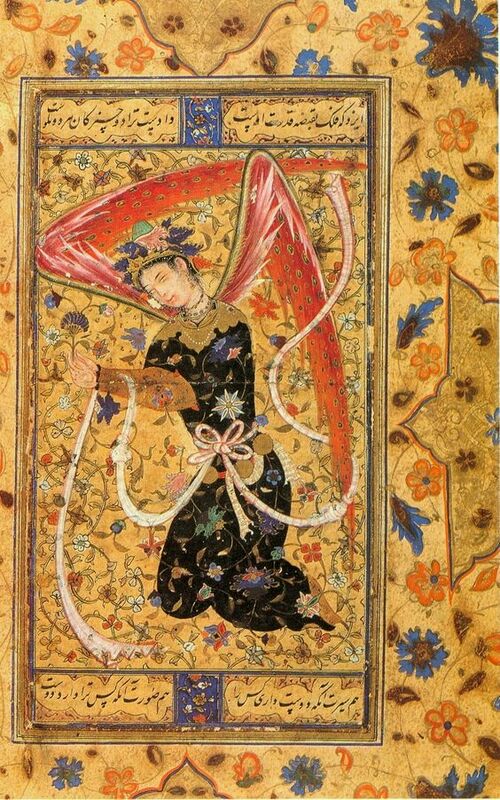 It not survived but was exalted by Islamic Persian artists in some of the most exquisite miniatures. Core beliefs of the Persians were passed on. It may well be surmised that without this transmission the Golden Age of Islam would have been far less likely to have occurred. 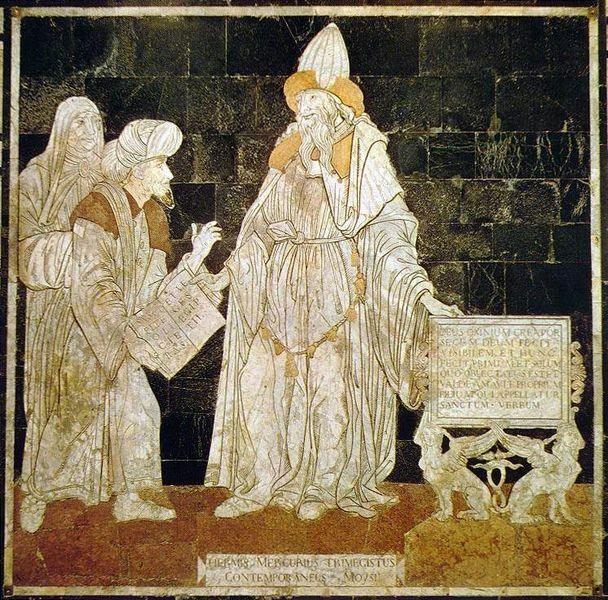 “Hermes the prophet of science is a combination of “ancient Judaean lore” concerning the biblical Enoch with Hellenistic astrology, including stories of heavenly ascents in order to receive science from the angels. ….. With Hermes as its prophet, science becomes revelation and as such is superior to the musings of the philosophers.” (Classical Review 2010.02.63). In articles to follow, we will look at a variety of other Persian and Indian sources. Mercury : The Hypocritical Planet? 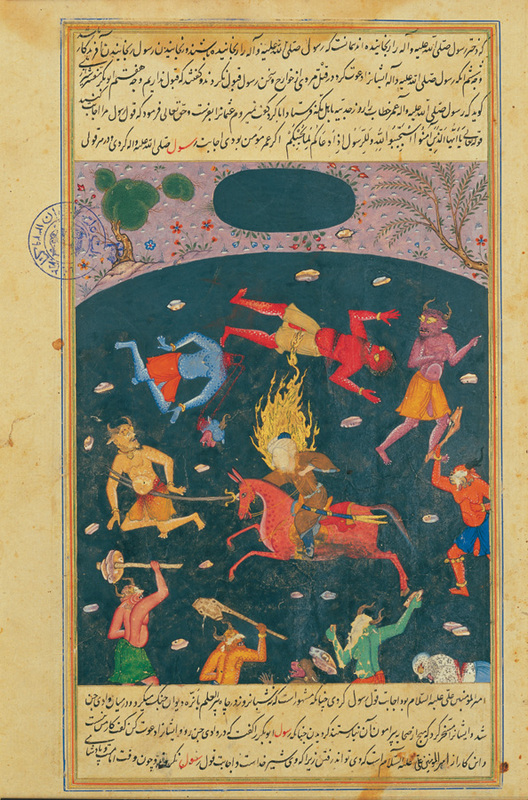 Gemini – Horoscope from ‘The book of the birth of Iskandar” Credit: Wellcome Library, London. “Not only is the practice of astrology is [sic] haram, but also visiting an astrologer and listening to his predictions, buying books on astrology or reading one’s horoscope are also forbidden. Since astrology is mainly used to predicting the future, those who practice it are considered fortune-tellers. Consequently, one who seeks his horoscope comes under the ruling contained in the Prophet’s statement. ” (See Sunnah Online). The prophet’s statement is concerned with fortune tellers and the annulment of prayers for those who visit one. When the passage is distilled, we find that the chief complaint is that astrologers predict the future. For now, I will simply state that predictions are also made by the weather bureau, ordinary farmers, physicians, political commentators and so on. The is no supernatural force at work, although as with the other livelihood a knowledge of the subject and a keen intuition are part of the skill. I mean to address this and other issues regarding what is haram or halal with respect to the celestial sciences. 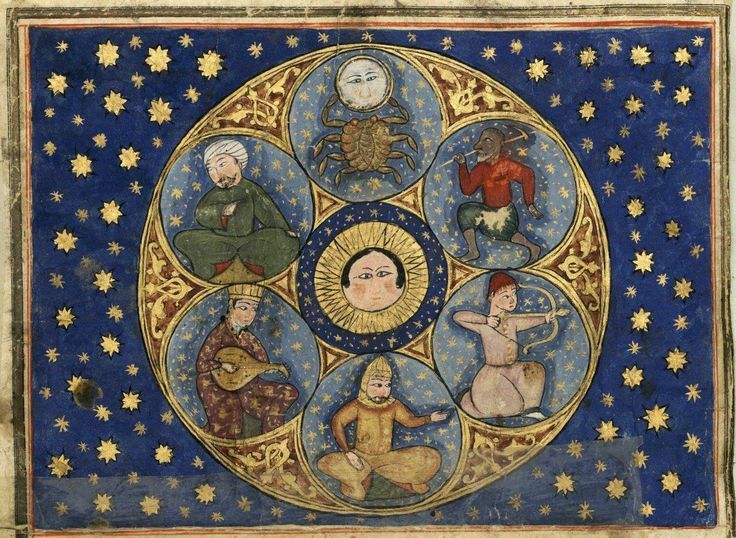 To begin, I will attempt to create a rough context for the practise of astrology in Islam, recognizing that this is the same or identical in other faiths. The question of whether or not astrology is permitted in Islam is not a simple question by any means. I have worked to place the question in the context of various forms of Islamic understanding, including the Quran itself. I find that the question isn’t so much whether astrology is haram or halal, but how astrology is interpreted in the first place. There is no question that the stars and planets are governed by laws that are above them. Plato, Plotinus, Aristotle, Ficino, Hinduism, the Abrahamic faiths along with all Islamic astrologers agree on that. This is why it is completely wrong-headed to consider authentic astrology as idolatry or placing the Creation above the Creator. That isn’t how it works. The passage is a clear parallel to Genesis, which shouldn’t be surprising. There were large Jewish communities in centers like MekKa and Medina at the time of Muhammad. At the same time, the epithets for Allah – “Cherisher and Sustainer of the worlds’ sounds more Hindu than Jewish. This is what Hindus call Vishnu. I make this comment to get the idea across that ancient Arabia was a culture of trade and with trade go ideas. They were not isolated. There is no more fundamental belief in Islam than the concept of Tawhid. Islamic scriptures are replete with This is but one. Here we have the instruction to “follow what thou art taught by inspiration from the Lord: there is no god but He: and turns aside from those who join gods with Allah. (Surah Al-Anam, 106). A term related to this is shirk – attributing partners to Allah. It would take either a great misunderstanding of Islam and astrology to conclude that the wisdom conveyed via the stars denies the oneness of Allah. The modifier “Sign for men who are wise” is crucial. Without special knowledge and insight, the further dimensions of meaning remain hidden. Indeed, there is no reason why everyone would need to know the greater workings of the celestial science. Nevertheless, everyone needs to know the everyday calendrical information. In Islam, the Moon is of great significance for this and many other reasons, as the flags and mosque symbols of Islam attest. In the desert the Sun is pitiless and the cool of the evening a welcome respite. Pre-Islamic Middle Eastern lunar deities were ubiquitous and often considered male. The image shows the phases of the moon in a month. This is a page taken form a calendar prepared by Sayyid Ahmed b. Mustafa Al-La’li, who presented this calendar to the Sultan Selim II in 1566. Courtesy of Sam Fogg – London. Classical astrologers have learned much of what they know from the ancient sources of the Middle East, Greece, Persia & India. 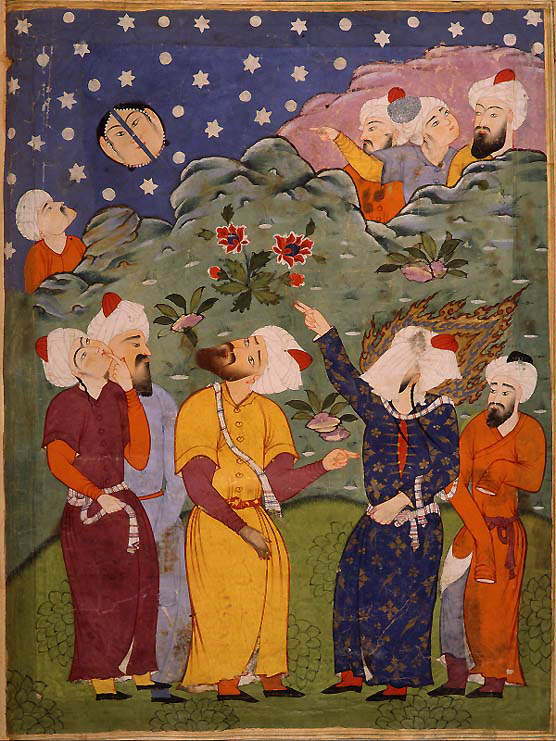 In what were the European Middle Ages and Renaissance, Islamic astrology came into what has become known as a Golden Age. So the question as to whether or not Islam permits the use of astrology isn’t likely to trouble many practitioners. I do not write this article with a mind to changing anyone’s point of view. I would, however, like to make it as clear as possible how classical astrologers, including historical Islamic ones, understand their own craft. In doing so, I make one short digression. The idea of belief is itself somewhat problematic. It lies somewhere in a grey area between faith and the void. We might also say that it’s like faith without understanding. For example, do I have to ‘believe in’ mathematics in order for it to work? Probably not. However, I’m not likely to derive much utility from mathematics if I refuse to employ the tools it offers. Belief has no sincere interest in the examined truth and is content to accept what others have said is true. The apprehension of truth takes time and effort. If this were not true, the world would have far fewer bigots. The unexamined life is not only not worth living, it is scarcely a life at all. Sometimes the question is as important as the answer. It very often happens that one is like the proverbial fish in the bowl, not cognizant of the fact that he is swimming in water because there is no experience of otherness to create that awareness. I was impressed by a very fine article “Is Astrology Permissible in Islam.” by Ugur Alkan, a freelance writer who holds a B.A. in Communication and an MBA in Management from Fort Hays State University, Kansas. The article is well written, but what attracted me most to the article was the stark boldness of the title in the form of a question. To some extent, this article is a response and dialogue with Alkan. 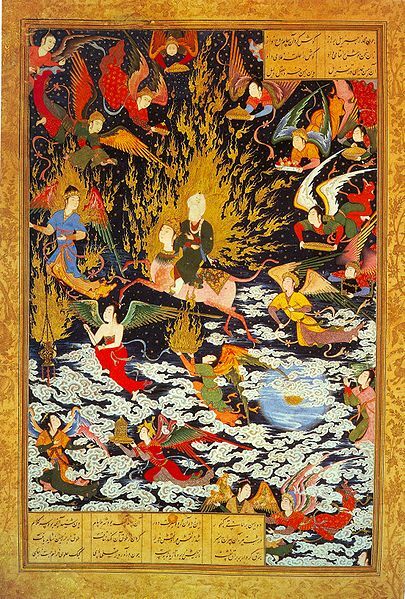 The demonic issue appears to be more complex in Islam than in the other Abrahamic religions because Islam includes the Jinn. One is not free to imagine there are no Jinn, any more than one is free to deny the existence of angels. These are elements of the Islamic faith. They are as much a part of Islam as who vastly outnumber humans and are invisible unless they choose to take a particular form. They are smokeless fire beings associated Iblis, the Islamic Lucifer. However, there are apparently many beneficial Jinns. The prophet Sulyman employed Jinn to great effect and this is celebrated in the Quran. They have also been associated with arts such as astrology. We are then faced with the situation of interrogating Hamlet’s ghost to determine whether the spirit is good or evil – a liar or a speaker of the truth. Although one might turn this into an impossible quest, thwarted at every step by the haunting possibility that a bad Jinn is deceiving us into believing it good, there is a way through. We can know what is good by what it produces. If true astrologers can provide medical insights, auspicious dates for doing anything from starting the building of Baghdad to planting celery, identifying areas of conflict between nations and between a brother and sister, we ought to rule out the agency of evil beings. Jinn vastly outnumber humans and are invisible unless they choose to take a particular form. They are smokeless fire beings associated with Iblis and they can live for several hundred years. However, there are beneficial Jinn. The prophet Sulyman employed Jinn to great effect and this is celebrated in the Quran. They have also been associated with arts such as astrology. We would otherwise be faced with the situation of interrogating Hamlet’s ghost to determine whether the spirit is good or evil – a liar or a speaker of the truth. Although one might turn this into an impossible quest, thwarted at every step by the haunting possibility that a bad Jinn is deceiving us into believing it good, there is a way through. We can know what is good by what it produces. There is nothing particularly different about this than things we do every day. A good recipe is judged by what the dish tastes like. If true astrologers can provide medical insights, auspicious dates for doing anything from starting the building of Baghdad to plating celery, identifying areas of conflict between nations and between a brother and sister, we ought to rule out the agency of evil beings. However, I’m in no position to deny that some forms of mediumship involving an alleged communication with spirits is mere fiction. Such is neither my expertise or interest. Although one might turn this into an impossible quest, thwarted at every step by the haunting possibility that a bad Jinn is deceiving us into believing it good, there is a clear way through. We can know what is good by what it produces. If competent astrologers can provide invaluable medical insights, auspicious dates for doing anything from starting the building of Baghdad to planting celery, predicting the weather, identifying areas of conflict between nations and between a brother and sister, we ought to rule out the agency of evil beings. Yet the Jinn are not be universally trusted by any means. There is an Islamic account, which might be apocryphal, that nevertheless holds a lot of weight. The story goes that angels get together to discuss the future, only to be overheard by evil Jinn who then corrupt the truth while leaving enough factual content to deceive the fortune teller and impress the querent. 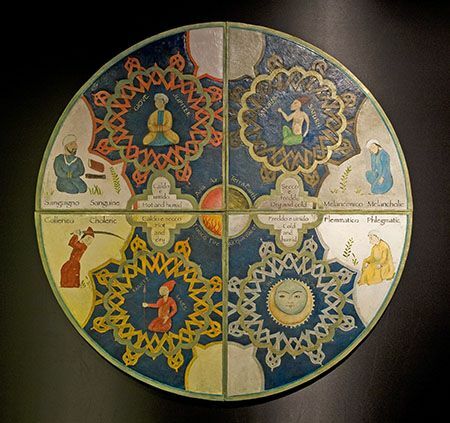 The Stars and Human Temperaments – this model, derived from Greek sources, such as Galen and explains the theory that illustrates correlations between celestial bodies and human temperaments. This was well-received throughout the Islamic world. “The word Jinn means “hidden” in Arabic. In The Holy Koran, they are described as being created from smokeless fire. Jinns are the descendants of Satan like Humans are descendants of Adam but most of them are very deceptive and dangerous for humans. When God has a certain event planned in our lives, he commands the angels to create the conditions to fabricate them. Before implementing God’s plan, Angels discuss this future event. In some cases, jinn sneaks up and overhear the future event and passes this information to the fortune-tellers through Tarot, I-ching or any other objects. Of course, the Jinns don’t intend to be favorable of humans; therefore, they muddle up the truth of future events with deception. As a result, the truthful events overheard from Angels are embellished with lies to cause confusion.” (Alkan). 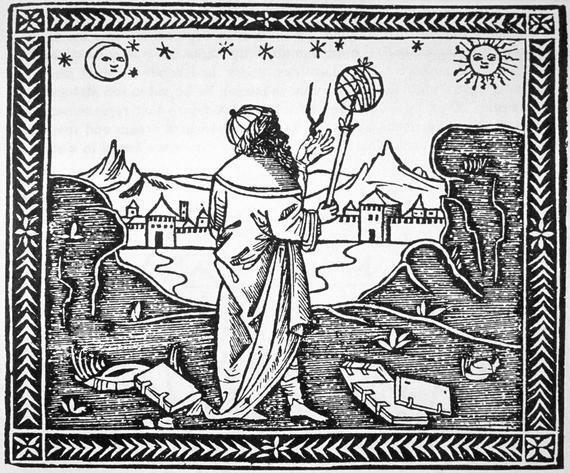 Alkan then refers to modern horoscopes wherein the Sun is regarded as the only star and therefore the knowledge that belonged to the ancients is lost. First of all, no serious astrology considers newspaper horoscopes as having anything to do with authentic astrology. True practitioners of the art pay a great deal of attention to fixed stars. For some, this may be all the scriptural references to prophets such as Daniel and Enoch may be all they need to accept the halal relevance of reading the stars. However, it is very difficult for many people to understand the difference between fortune telling and authentic astrology. In large part, the difference is not merely in the technique, but in the intent. If I say we are in for a very cold winter because I have learned how to read the signs of nature, such as the curling of leaves or the activity of crows, I’m merely stating that this is what happens when these signs manifest. This kind of divination is common among people who interact with and live close to the natural nature. In fact, a Muslim colleague from Pakistan once told me that reading the stars is reading the signs of nature. If this is the case, astrology doesn’t differ much from meteorology. To refer to it as polytheistic is to completely misunderstand the nature of astrology. But what if I say you will meet a man in a white suit on Sunday 21 August. He has brown eyes and you will marry him? Here, we have gone from reading the signs of nature and no matter what technique is used there are several problems. We are talking about humans here and humans have choices to make. Even if this mas were to show up on this date in that suit, neither of you have indicated an interest in marriage. Can the reader be certain that the man won’t spill chocolate sauce over his suit, causing him to change it? The point here is that we are not really reading the signs of nature – I do not know of an astrologer who could predict with such personal detail, for a specific date. It is on these occasions that dark forces might be implicated, not only with Muslims but other belief systems as well. It is precisely because we cannot point to the action of crows of the entrance of a planet into a new sign, to explain the findings. A great deal is riding on the answer to the simple question “is astrology permitted in Islam.” This question ultimately goes far beyond astrology itself. There are very many sub-sects of Sunni and Shia Islam, There are many Muslims who insist that music is haram, yet music and dance are very much part of the Islamic legacy. Some groups in Pakistan and Sub-Saharan Africa, for example, systematically destroy Sufi shrines or anything at all that could leave the impression that Sufism was ever a part of regional cultures. Islam has taken the Abrahamic hatred for idolatry to the most extraordinary heights, being seemingly unable to distinguish between the evocative value of art from the worship of idols at all. This was why the Bamiyan Buddhist statues were destroyed. It was considered a holy act and I think they were sincere, even if regrettably misguided. The world lost an extraordinary heritage site, going back to the Buddhist period of what is now called Afghanistan, but to a literalist who considers all religions but his own as idolatrous, their destruction was an act of piety. The answer, if you get one at all, to the question: is astrology permissible in Islam will depend on who you ask, which source texts they consult and how they interpret them. All three criteria are subject to a multitude of considerations. 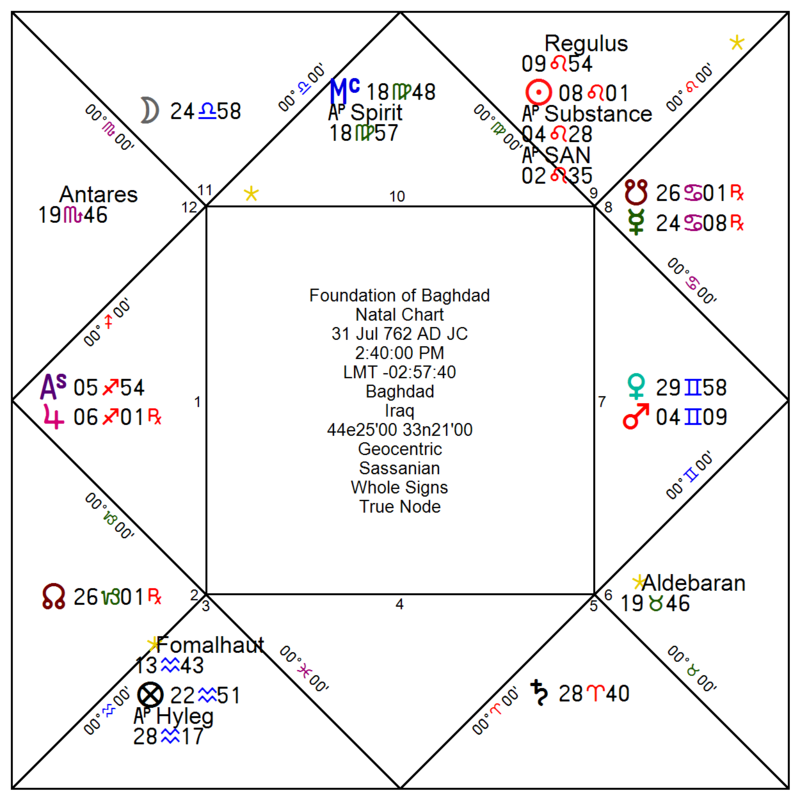 I have been in touch with various Islamic scholars over the years and while most will deny that Islam supports astrology, there have been a few that do. In all cases of those who rejected astrology, I found that they had a vastly different concept from me regarding what astrology actually is. Although there is a rich tradition of astrological use, including from highly respected Islamic sources. 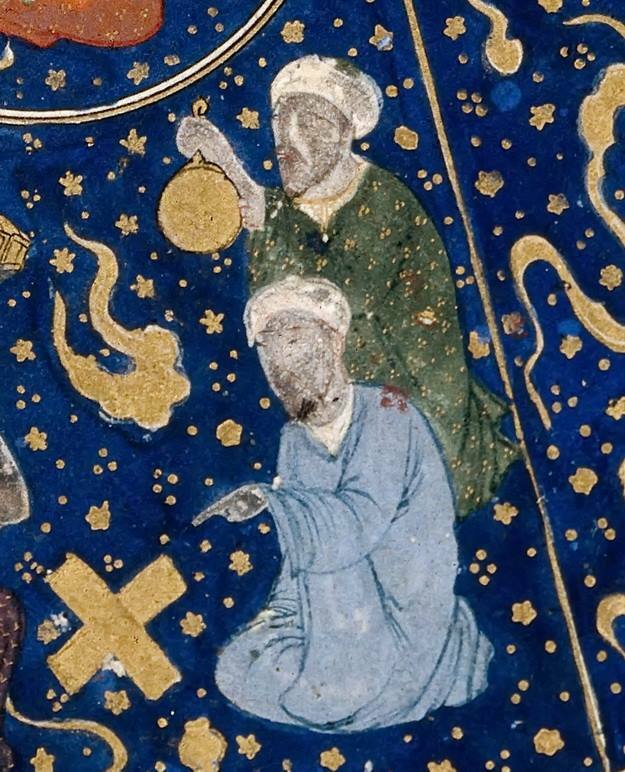 The fact that the timing of the construction of Baghdad was trusted to astrologers and that medicine was so inextricably connected to astrology appears to be better known outside of Islam than within it. Clerics differ wildly on many subjects, but with respect to astrology, polarized views are adamantine. Attempts to explain the true nature of astrology are mostly doomed before they begin. 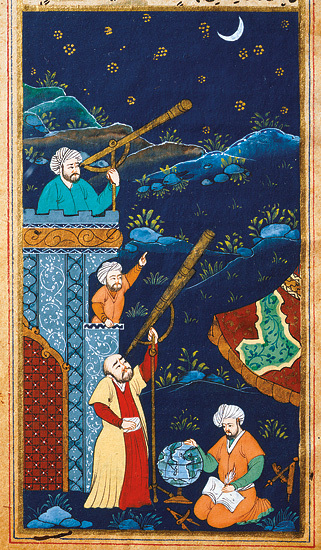 One of the fruitful paths is to show how astrology has been used by Muslims and particularly during what is considered the Golden Age of Islam. 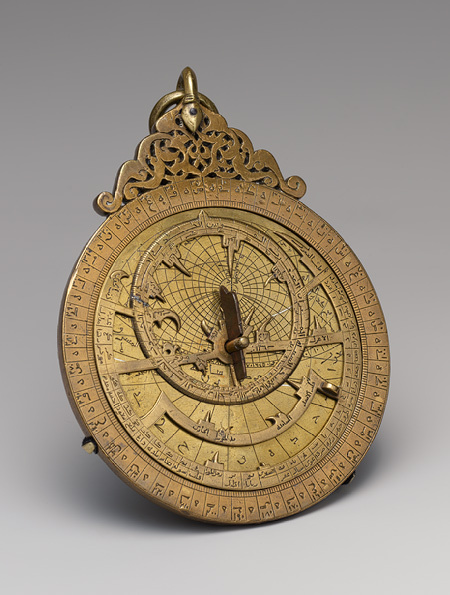 Canopus the “Celestial Navigator.” – The star used for the orientation of the Kaaba. Canopus shines 1400 times brighter than our Sun. 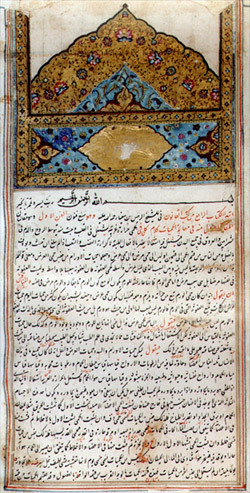 Take for example the celebrated “Book of Wonders” by Zakarīyā ibn Muhammad al-Qazwīnī (circa 1203–83). He was a distinguished Iranian scholar who was conversant in poetry, history, geography, and natural history. He served as legal expert and judge in several localities in Iran and at Baghdad. After traveling throughout Mesopotamia and Syria, he wrote his famous Arabic-language cosmography, ‘Aja’eb ol-makhluqat wa qara’eb ol-mowjudat (The wonders of creation, or literally, Marvels of things created and miraculous aspects of things existing). This treatise has been translated into Persian, Turkish, and German and is concerned with subjects such as astrology, cosmology, and the natural sciences. The author was very fond of Pliny the Elder and other Greek classical works. as well as the rich sources then found in the Middle East, Northern Africa, and India. “Book of Wonders” by Zakarīyā ibn Muhammad al-Qazwīnī (circa 1203–83). This is but a drop in the ocean. Masters of several arts, like Ibn Sina, born in what is now Uzbekistan, wrote voluminous medical works filled with thousands of pages of pharmacopeia and used even in Europe until a bit more than a hundred years ago. He was also an astrologer and he used this as an integral part of his medical practise. He spoke several languages, was extraordinarily well versed in philosophy and theology among many other things. His correspondence with Al Biruni is extant and illuminating, for anyone wishing to get a deeper insight into the Islamic culture of the period. There is a statement attributed to Hippocrates, although the written location of the quote remains a mystery. Nevertheless, it is by no means out of place with what we know about Greek humoral medicine. This was certainly taken to heart by Islamic translators of Hippocrates, Galen and others. 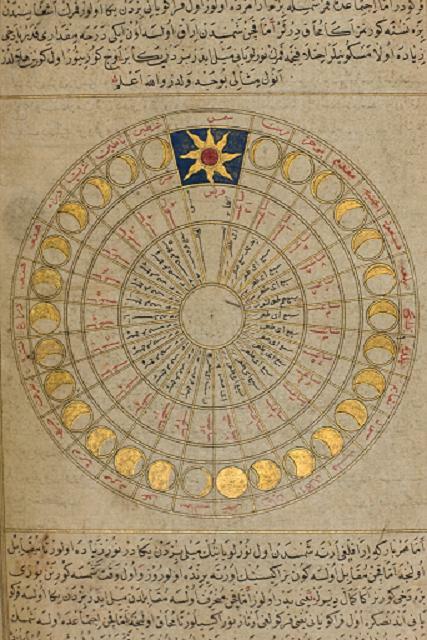 : “A physician without a knowledge of astrology has no right to call himself a physician” We can also look forward to Guido Bonatti and others who were instrumental in the transmission of Islamic astrological ideas and methodologies. Bonatti was a great influence on the English Astrologer, William Lilly, who in turn imparted medically relevant knowledge to Nicholas Culpeper (1616-1654). Culpeper was a friend and student of the astrologer William Lilly who worked with Culpeper on the attribution of astrological characteristics of both herbs and the patients being treated. What is seldom mentioned is that Culpeper knew of Avicenna and had access to his work. Culpeper refers to this as “astrologo-physical discourse of the vulgar herbs.” In his most celebrated work on medicine, The English Physician (1652), Culpeper’s lays out the relationship between plants and astrological considerations in the service of medicine. Al Biruni spoke several languages, wrote an incredibly detailed and insightful book on the history, religion, and philosophies of India was also an extraordinay astrologer and is still studied today. There are dozens of others that can be cited, but this will not convince anyone who has decided that astrology is haram. Indeed, many of the most brilliant minds in Islam were accused of heresy and/or exiled. Muslims often opine that the decline in Islam is a result of not following the literal interpretation of the Quran and Sunnah closely enough. In light of the achievements realized when Islam was a relatively open religion, respecting and admiring, for example, Classical, Indian and Persian antiquities, the appeal to fundamentalism as a cure for what ails Islam is not a case one can make without distorting history beyond recognition. The philosopher Al-Ghazali was rather like the Savonarola of Andalusia – except that Islam has not yet fully recovered from his eloquent but misguided call for literalism and fundamentalism, effectively closing the door on the extraordinary developments in Europe. If Averroes had won the debate, Islam would most likely have had its own Renaissance and Enlightenment. However, he lost and was sent into exile. Of course, other religions, particularly some versions of Christianity have had their own iconoclasts and toters of pitchforks and torches, accusers and inquisitors. Even today I would wager that the vast majority of Christians would denounce astrology, if asked, only to check the horoscope in the newspaper because “it’s for entertainment only.” Few are aware that astrological ideas and imagery are woven into what was once called “high Church.” Many of the Popes had astrologers. This combined with a short survey of Qu’ran quotes will cause some to view astrology with an open mind and the rest will essentially go into a sort of denial. It’s very easy to find lists, for those interested. Muhammad’s only son died at approximately age two and the passing coincided with a solar eclipse. Understandably, the father was stricken with grief, but he did something that might seem odd to us. He summoned all his companions. “Prophet Muhammad wanted Arabs to eradicate the pre-Islamic era paganism and superstitious beliefs. Distraught by the death of his son, he gathered his community and told them that solar eclipse is an irrelevant event and does not occur in correlation to someone’s birth or death. The experience of Prophet Muhammad is considered proof that there is no celestial influence or synchronicity between such phenomenon and human events. ” (Alkan) This may well seem to contradict the Quran, but it does, in fact, agree with it. A single and fleeting astrological event like this shouldn’t be blamed on the eclipse. 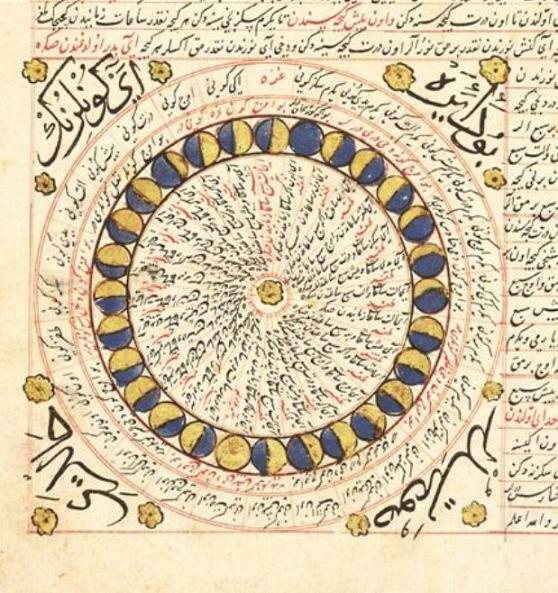 Eclipse Lunar Moon phases and eclipse illustrated by the great tenth-century Persian scholar Al-Biruni. For many years, I assumed that all Muslims took these stories as metaphors od a mystical experience as do I. The alternative is rife with problems, even more so than the Night Journey. The prophet literally flew to Jerusalem on the back of the buraq steed. met all the Abrahamic prophets and returned without being seen. Again, as a metaphor, it’s a wonderful story, but if I have no choice than to believe it’s literally true, that’s all well and good, but one cannot then claim a distaste for faith based on unverifiable facts. It is impossible to ignore the fact that before and after the prophet, there was a highly evolved science of the stars that had precious little to do with superstition with demonstrative techniques and stunning accuracy. “It is supposed that they influenced the practices of the Hellenic Theosebeis. While their angelology, was based around the movements of the Sun, Moon, Mars, Mercury, Jupiter, Venus and Saturn. 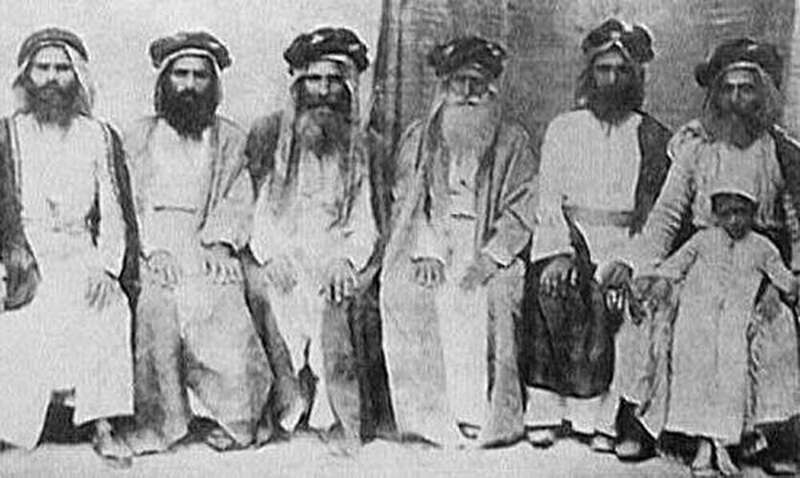 They found its greatest development in the community which was based in the Harran region of south-eastern Anatolia and northern Syria, who were distinguished as the Sabians of Harran from the south Mesopotamian Sabi’una Hunafa by later Islamic writers like Ibn al-Qayyim” (Creative Commons). It isn’t unusual to think of the planets and luminaries as angels or messengers. Indeed, that is the most common understanding of the part they play in astrology among traditional astrologers from virtually all traditions. 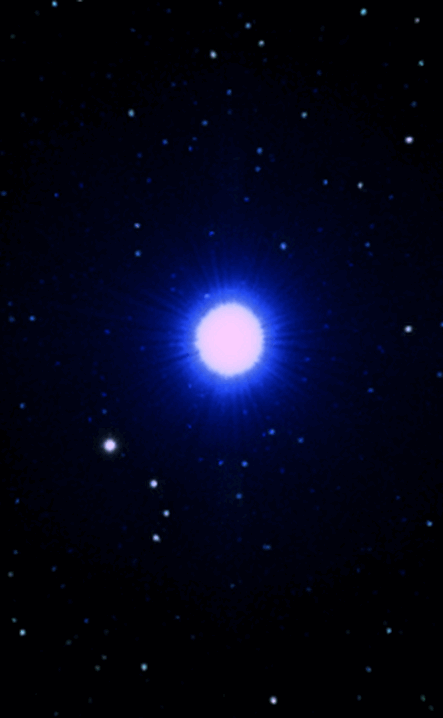 The Sabians are a monotheistic religious group who worshiped in the names of stellar angels. This religion understandably became confused with the worship of the celestial bodies themselves, rather than their creator, as the dwellings or mansions of the powers above the visible orbs. Sabeanism was one of the archaic religions found all over the world in different forms. In its origins, Sabianism was undoubtedly a continuation of the rich tradition of star lore in the Middle East which go back to deepest antiquity. 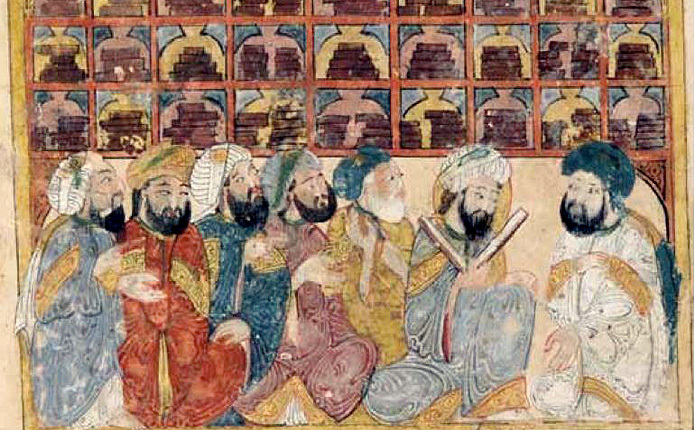 There was a later tradition that tells us that Muhammad was himself a Sabian before his conversion. The Sabians are monotheistic and the celestial world was of the utmost importance to all groups in the region and far beyond it. It is interesting that Canopus is used as the star of orientation regarding the Kaaba because the star is known as the Celestial Navigator. The greatest irony, of course, is that Muslims who consider astrology haram, really don’t know what it is. The question of whether or not astrology is permitted in Islam, will, of course, be the decision of individual Muslims as well as sects of Islam. Nevertheless, from an objective point of view, the fact that astrology has been integral to the development of Islam and was used by its most brilliant proponents is compelling. The Quran itself is replete with variations on the idea that the Stars are guides for the wise. Beyond that, I sympathize and understand potential problems in the misuse of astrology. The first part is the need for the discernment of spirits, as it is known in European cultures, but in fact emphasized by St. Paul. The true astrologer is conscious. The techniques take many years to learn, and much more to master, but in the end, one cannot dispel higher intuition out of the nexus. One needs to be clear with potential clients who treat astrology as of it were a slot machine or something to enforce an illusion. Astrology is good and strong medicine, but like any medicine, the quality of the practitioner is the greatest consideration. Among the many joys of practising traditional astrology, is the opportunity to fully explore the inner planets. When the going gets deep, the shallow resort to ‘higher octave” delusions. The formula seems to be if it’s deep, make sure it’s as far away from the Sun as possible which strikes me as perverse. Being personal doesn’t mean it can’t also be universal. Let’s take Mercury for example. Mercury has the be the most skimmed over of all planets. This is really unfortunate because Mercury in his many manifestations has perhaps the richest set of attributes of all. Everyone interested in astrology knows Mercury is about communication and short journeys and not much else. In fact, he is probably best known for the Mercury retrograde effect. Let’s begin with the glyph. The Semi-Circle, Luna symbol is Soul. The Solar circle is Spirit. They are above the Cross of Matter. 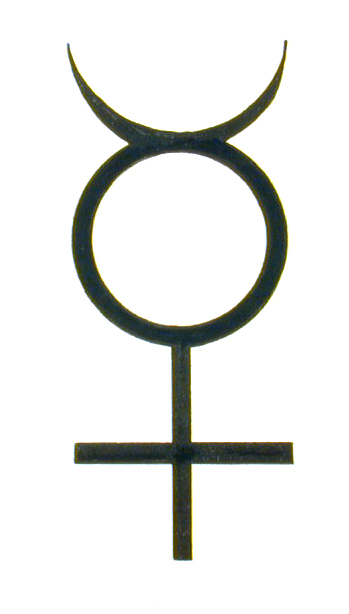 Although Mercury is usually referred to in the masculine, *he* is in fact the primal hermaphrodite that takes on the gender of it’s sign and position. However, it’s Mercury’s nature to communicate both the Solar and Lunar Self. As the Magician, he channels this energy to the world of Matter, symbolized by the Cross. 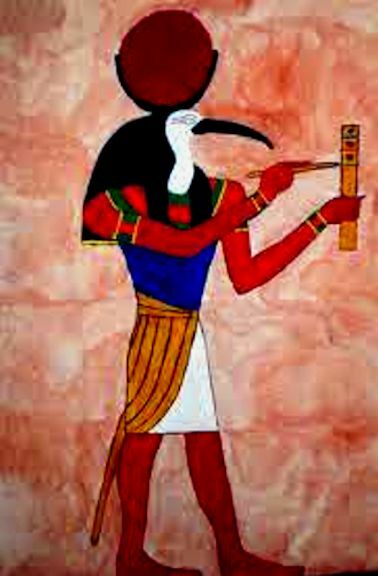 The image of Thoth (below) embodies the nature of Mercury. He has the Solar – Lunar disk above him. He is in the form of the Ibis. There has been much contention about why the Ibis was chosen as representative, but the most important issue is that it represents Spirits of the Air or intellect. No matter which form he takes, whether Mercury, Hermes or Thoth, he is a winged deity. Thoth and Hermes were credited with the revelations of writing, mathematics, magic, astrology, astronomy, medicine, and the almost completely forgotten role of Psychopomp, conductor of souls to the next world. When we consider all of these, Hermes takes on a redemptive quality. Yet Modern astrologers have ascribed all of these qualities to the outer planets, mostly Uranus and Pluto. Now that he is virtually ignored, or written off in a sentence or two as the most boring planet, we can see the extent of the loss. As messenger to the two luminaries, he was held in very high regard. He is also credited with revealing the musical spell to bring Osiris back to life. In the earliest Egyptian sources he is a self created god. These words of Hermes contain the essential dictum of “As Above, So below.” However the precise way that we comprehend this will depend on which model we are using to reference. For example, it is completely in keeping with Plato’s doctrine of the Forms, the idea that meterial, physical reality is not the ultimate one. If we follow this essential teaching through the Works of Plotinus, we have a complete system of thought that is mystical. A key image in the Enneads is the fountain of light, from which all originate and ultimately return. 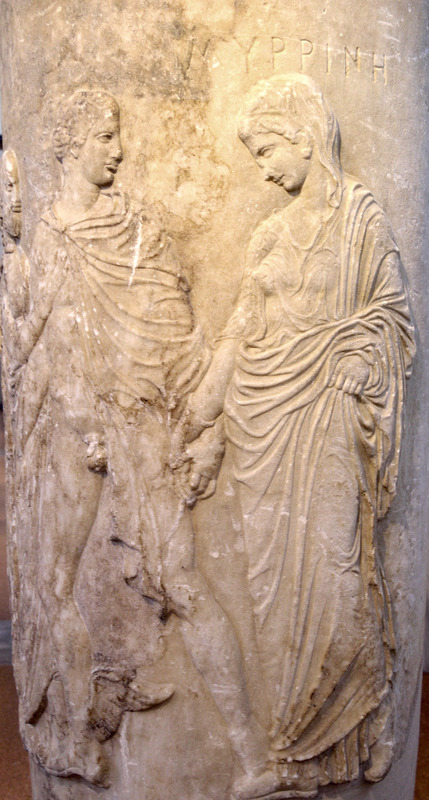 In the magical tradition of Hermes Trismegigstus, Pico dell Mirandola uses the image of Hermes wedding Earth to Heaven. 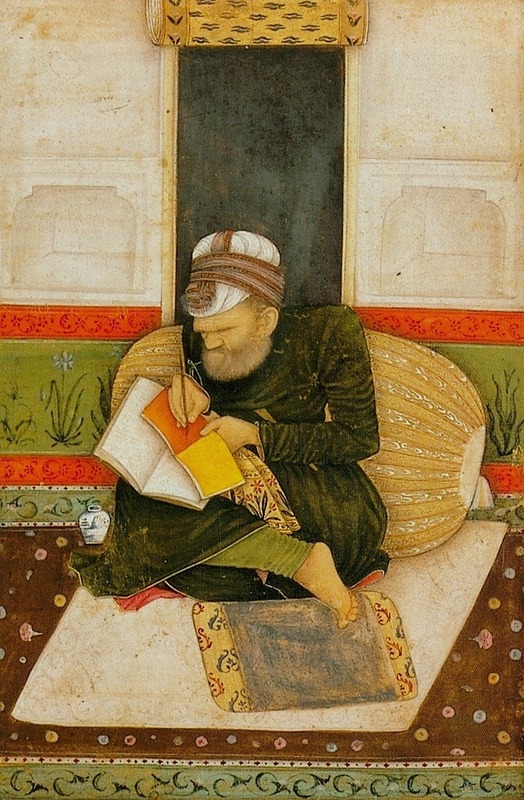 The early Abbāsid court astrologer Māšā allāh (fl . 762–ca 815) has been called the Prince of Astrology by Robert Zoller. He was “an associate of Umar ibn al-Farruxān aṭ -Ṭabarī, cites Hermes as an authority in his own Arabic works. He may well have known works of Hermes in the Middle Persian original; being a learned Iranian Jew, Māšā allāh could have had access toAramaic and Persian sources as well as Arabic’ (Pingee, Masa’ allah 1973. pp. 159 – 62). Several other Arabian astrologers including Al Biruni are discussed in Kevin van Bladel’s The Arabic Hermes: From Pagan Sage to Prophet of Science. It’s fair to say that Masa’Allah was the most erudite of scholars at the Abbasid court as well as the finest astrologer. How he received Hermes therefore has resonance in European and Arabian astrology, particularly prior to the Renaissance. Their sources were Middle Iranian and not Arabian in origin. The Persians had taken and translated Hermes into their own language, and as is the case in all cross cultural receptions, Persian elements were attached. However, as can be seen by the photo of the “Arabian Hermes” he has all the same attributes, albeit in what contemporary Greeks might have thought an exotic fashion. Hermes is much more than Magician and Psycopomp, but I believe these are the most ignored attributes in our time. Finally, we have the beautiful Alchemical illumination from the Buch der Heiligen Dreifaltigkeit on the left. This has remained mysterious, although of course many scholars have had their theories. The image is very similar to the previous Arabian illustration, certainly not in style but in substance. Here the Mercurial figure is female. As mentioned, Mercury can be both genders, but is rarely portrayed as a woman. The caduceus- like form is there, with the Sun and Moon, but it’s reversed. She forms an ascending triangle. This image gives much to contemplate regarding the feminine attributes of Hermes. 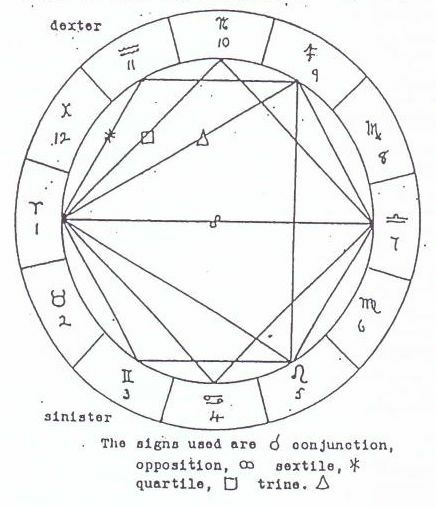 This is one more very brief introduction to the schemata of astrological aspects as expressed by Al Biruni in his Book of Instruction. The aspects he uses include the Inconjunct or Quincunx, refered to by Claudius Ptolemy as an aversion, rather than an aspect . Al Biruni has discussed the Inconjunct immediately before the insertion of the schemata. Oddly enough he opts not to include it in the visual presentation but gives a full written explanation. We will lok at what he has to say as well as Ptolemy’s comments on the subject in his Tetrabiblos. As the complex must follow the simple,we have now to consider the relations of the signs to each other. Each sign is in Sextile aspect to the third and seventh left and right of it, and there is s sixth of the zodiac (60 ° ) between any degre of that sign and the same degree of those named. Similarly the Quartile aspect is a between a sign the fourth and tenth, left and right, separated by 90 ° , and the Trine between the fifth and ninth, distant 120° and the Opposite sign is the the seventh, 180 ° There are therefore seven signs to which the sign in question turns its face and which are consequently considered to be bound in aspect to it. The two signs which are each side of the one in question and their opposites viz. the second and the twelfth and the sixth and the eighth are not in aspect and are inconjunct. (Instructions p. 20). The following is the order of power of the various aspects. The most powerful is Conjunction. i.e. meeting in the same same, then the opposite [Opposition] then the dexter Quartile, sinister Quartile, dexter Trine, sinister Trine, dexter Sextile, sinister Sextile, When there are two aspects the powerful renders the weaker one incompetent and takes away its power. (Instruction 21). All signs, between which there does not exist any familiarity in any of the modes above specified, are inconjunct and separated. 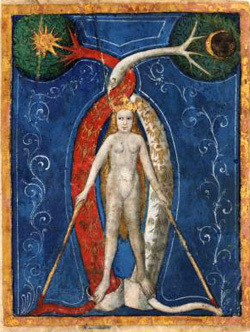 For instance, all signs are inconjunct which are neither commanding nor obeying, and not beholding each other nor of equal power, as well as all signs which contain between them the space of one sign only, or the space of five signs, and which do not at all share in any of the four prescribed configurations: viz. the opposition, the trine, the quartile, and the sextile. All parts which are distant from each other in the space of one sign only are considered inconjunct, because they are averted, as it were, from each other; and because, although the said space between them may extend into two signs, the whole only contains an angle equal to that of one sign: all parts distant from each other in the space of five signs are also considered inconjunct, because they divide the whole circle into unequal parts; whereas the spaces contained in the configurations above-mentioned, viz. the opposition, trine, quartile, and sextile, produce aliquot divisions. Although there is overall agreement, there are significant differences. Ptolemy doesn’t specifically mention the Conjunction that Al Biruni put at the top of the list of aspect power is concerned. I get the impression that here is simply taking it for granted. He was universally understood as including the Conjunction as far as I know. Ptolemy makes no distinction between Dexter and Sinister. Most importantly, he doesn’t provide a hierarchy of power to the aspects at all. Neither Al Biruni nor Ptolemy discuss aspect patters, such as Grand Trines, Grand Crosses or even T- Squares. Al Biruni’s statement that the most powerful aspect renders the weaker one incompetent is broad in its compass. When reading a specific chart we may have some difficult choices to make in judgement but he dose provide us many toosl to make that choice easier. However, as the statement stands alone, it seems reductionist. Consider for a moment a hypothetical chart with a tight Air Trine. One of the planets is forming a square or opposition to a fourth planet. Particularly if the square is applying, that is very strong aspect. It may even be in aspect to a malefic, making it far worse. But I still can’t see how the grand trine is entirely erased from the equation.. massively weakened perhaps but not without any life at all. 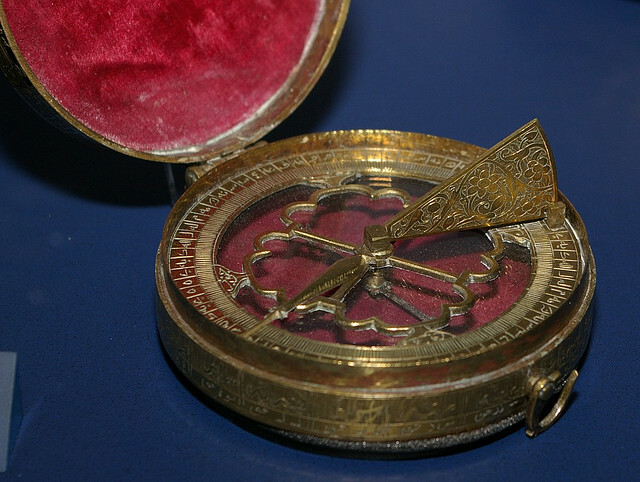 Compass – Part of Middle East exhibition in Victoria and Albert Museum, London. This is but a simple introduction to determining and interpreting directions, using astrological methods according to Al Biruni. 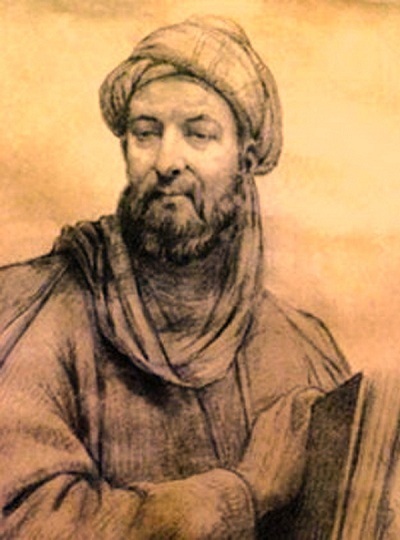 Abū al-Rayhān Muhammad ibn Ahmad al-Bīrūnī known as Alberonius in Latin and Al-Biruni in English, was a Persian-Chorasmian Muslim scholar and polymath of the 11th century. Today he is well known and respected by Traditional Astrologers, a well as by students of the history of medicine, mathematics, his insightful views on India and other nations from the point of view of one of the most learned men of his generation. In his The Book of Instructions in the Element of the Art of Astrology, written in 1029 AD Al Biruni provides a chart of directions. It’s very easy to read and has obvious applications in different forms of astrology It seems to me this would have the most immediate use in Horary as well as Weather Prediction. If you wish to go deeper, he provides a great deal of information about the nature of the elements and how they interact, giving very specific examples of precise weather prediction among many other things. “Aries denotes the middle of the East, Leo a point to the left of that towards the North and Sagittarius one to the right toward the South; similarly with each of the other triplicities. This Taurus indicates the centre of the South, Virgo a point to its left toward the East and Capricorn one to the right and West. Gemini occupies the centre of the West, Libra a point to its left and South and Aquarius one to its right and North. 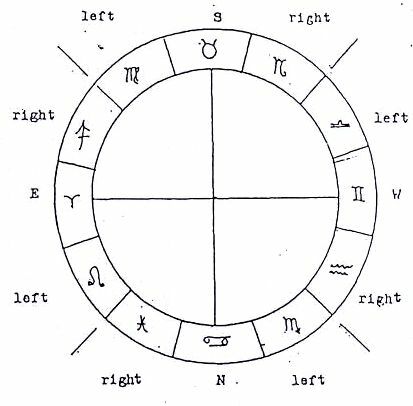 Cancer is in the centre of the North, Scorpius a point to the left and West, Pisces to the right and east.” (Instructions p.8). If you use this simple reference tool with the knowledge of what combinations of signs, planets, fixed stars and other elements of chart delineation, produce what results you’ll find it very useful in predicting the weather, including such details as the direction of the wind This system could be used to find lost objects and play a role in casting Elections. Al Biruni is something of a genius when it comes to simplifying what might otherwise be off-putting to many readers. He is deceptively simple.